Garry P. submitted this photo and caption. This is a photo of the 1973 Velvet Knights tenor line. You can see how much design has changed over the last 40 years. 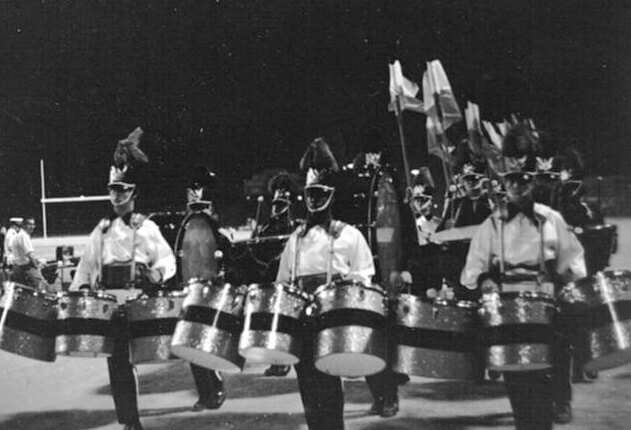 We first got these drums for the 1970 season, and they were prototypes from Rogers drum company. These never went into production. The drums were 14", 16" and 18" in diameter, and the center drum was a little shallower than the outside drums. One forward-looking feature was a rack system that eliminated the need for straps. The drums were suspended from a backpack harness. We were also afforded the luxury of wearing them lower, as you can see by comparing this photo to photos of our contemporaries. Each set weighed 65 pounds. I can't imagine doing current drill with these things on! I'll have to try and find a picture of our bari- and bass-tri-toms. They were bigger! From left to right: Garry P., John H. and Mike Q.